The Flex-a-lite remote transmission oil cooler provides transmission oil cooling where free air flow is not available. 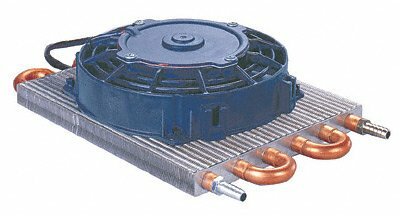 This cooler can be mounted in an area of the vehicle with no ram air flow. This compact unit features a 300 CFM electric fan that provides its own cooling air supply. Overall dimensions of 7 1/2" x 12" x 3 1/8"